• Adjusted the radius at which incendiary and smoke grenades interact. • In Spectator Mode, Scoreboard and Server Graphic will now obey hud scale and position settings. • Added server convar tv_allow_camera_man_steamid that should be set on tournament servers to the full 64-bit numeric SteamID of production caster (e.g. 7650123456XXXX). Tournament production casters who launch the game with the “-interactivecaster” command line flag and join the in-game spectators will get all camera and voice recorded and broadcast on GOTV. • Upgraded runtime libraries to use the latest Steam SDK. • Fixed a frequent crash during map loading while the game was minimized. • Various weapon CPU optimizations. • Added flavor text to Chroma Case weapons. • Fixed a bug where a boosted player in T spawn could peek into mid/CT sniper position. • Moved a prop to make peeking into palace easier, CT side. • Removed a strange boost in bombsite A. • Fixed a bug where an incendiary grenade could explode on bombsite B ceiling beams and damage players in A site. • Rerouted entrance into upper park from bombsite A. • Changed mid cover in bombsite A, corners can now be shot through with rifles. • Changed cover in T side of upper park. • Moved T spawns forward slightly. • Moved bombsite A plant zone up slightly. • Fixed P2000 ammo capacity. • Fixed a corrupt packets issue that occurred when a client attempted to play on community servers after official servers. • rcon stats now include server frame simulation time ms, stddev of simulation time ms, and tick precision ms.
• Fixed an exploit used by malicious servers to bypass SERVER_CAN_EXECUTE restriction on connected clients. • Fixed achievement icons not displaying. • Keys purchased from the Steam Community Market are given a seven-day trade and market restriction. • Reduced P250 ammo from 5 magazines to 3. • Reverted CZ nerf to ammo and fire rate. 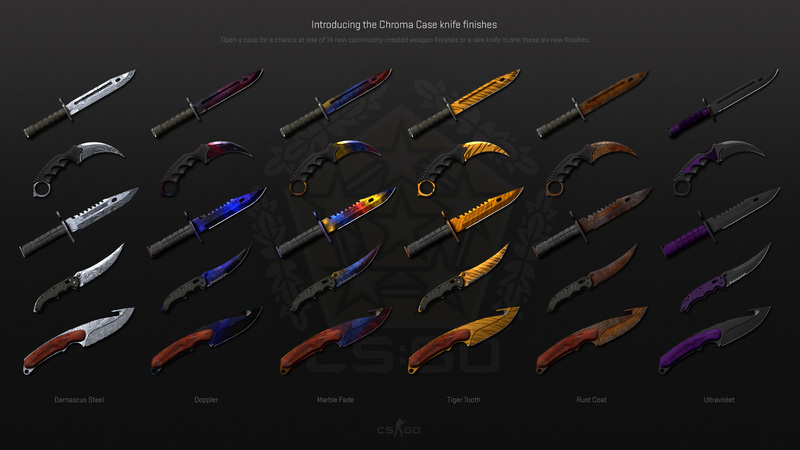 • Added the Chroma Case, that features new finishes for knives. • Added UI for showing multiple offers. Ich wünsche allen im Namen von UnPure ein frohes neues Jahr 2015! Ich wünsche allen im Namen von UnPure einen guten Rutsch ins Jahr 2015! Lasst es krachen, feiert gut, aber trinkt nicht zuviel damit ihr nicht zu weit rutscht! Auf in ein neues Jahr mit vielen Änderungen, Neuerungen und vielem mehr!